Dina Kowal Creative: Showers of blessing! Here's a little news for you........ I get to add this little button to my sidebar as a member of this new, fun, and informal team!! I'll be sharing some Sweet 'n Sassy cuteness from time to time. I've been practicing with my Touch Twin markers the last few weeks, trying to get the hang of blending and techniques... it's fun to learn a new coloring medium! I've been playing mostly with digital stamps, and recently added some more SNSS digis from to my collection - this is from a set called Let It Rain - there are soooooo many things I love about this set! By the way, it's also available as a clear set now! I had a little fun with the blender pen on the puddle, and added some dimension with Crystal Lacquer. Love those bare toes! By the way, it has been raining almost nonstop here for the last few days... so this stamp seems incredibly apropos...... now to focus on the blessings instead of all the puddles!! Oh my, Dina, she's beautiful. You colored her so lovely. Dina, this is absolutely fabulous. 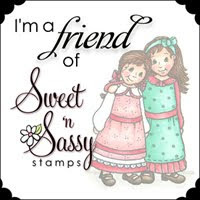 I am so happy you have joined us as a Friend of Sweet 'n Sassy. We are so blessed to have you!